The Powershots can be used with any kind of strobe, but they were designed with a dedicated TTL flash system, which they share with Canon's 35mm film cameras. The flash system uses a method Canon calls E-TTL. The digital cameras perform a bit differently from their film brothers (and sadly, fail on a few points). This page talks about a few of the ways they differ. The current top of the E-TTL line is the 550EX. The "550" indicates the metric guide number of 55 at ISO 100  in full manual mode, at ISO 50, f/2.0, the flash can correctly expose at a whopping 20 meters from the camera. The "EX" indicates that it's an E-TTL strobe (older non-compatible EOS strobes are tagged "EZ," and older pre-EOS strobes are marked "A" or "G"). Other models of "EX" strobe include the 220EX, 380EX, 420EX, the new EX Ringlight, and an EX-compatible wireless transmitter, the ST-E2. All of them appear to partially work with the Powershots (including, apparently, the ringlight). All of the strobes deliver normal E-TTL automated results. The two top models, 420EX and 550EX, provide a number of extra features and modes. Not all modes are directly supported by the G1 (I've yet to get ahold of a Pro90 to test, but reports do not sound promising), but they can be used with a bit of finessing. The G2's support of E-TTL is much better  while not officially supported by Canon, most modes do function correctly. The new G3 and G5 have official support at last! This is very welcome news. E-TTL flash classifies cameras as either "Type A" or "Type B," which defines their range of E-TTL capabilities. Depending upon which Canon rep or technician you ask, and which day you ask them, Canon reports that the Powershots are either "Type A" or "Type B" cameras.... in practice they seem to be neither. My E-TTL setup currently consists of a 550EX and the ST-E2 wireless transmitter. The transmitter just plugs into the hotshoe like a normal flash unit, and sets off the 550EX via an IR signal (it works with the 420EX, too). I also purchased Canon's two-foot off-camera cable, but I've hardly used it since getting the wireless (one good use to the cable  it can sometimes be used with the IR transmitter, allowing me to aim the ST-E2 more directly at the slave strobe). Together, they add tremendous flexibility to automatic flash shooting  I can pretty much put the 550EX anywhere I like, and the automatic exposures will generally be right on. Better still, the ST-E2 is very, very light. A big plus compared to the 550EX alone, which is quite heavy  heavier than the camera. The ST-E2 works with either the 550EX or 420EX strobe units (but results seem to be mixed with the 420  though some users have reported results identical to that of the 550EX). The portrait above is typical  the 550EX is set up on a stationary stand (in this case, with an umbrella), and I'm free to move the camera around without worrying about the light  at least, within the range of E-TTL's control. E-TTL is automatic, and when you let the camera decide things you may not always agree with its choices. In particular, if a shot has a lot of white, or a lot of black, the automatic system may not be able to handle it. This is true of all TTL metering systems, of course  both for flash and existing-light exposures. Because the G1 has multiple exposure modes, here's a little table describing the combinations of the G1's modes with the external strobe. Except where noted, all E-TTL functions should be the same for all Canon E-TTL strobes (if you have different information, please let me know!). As mentioned above, the ST-E2 remote only works with the 550EX and 420EX strobes (and reputedly, the ringlight). AUTO Just as advertised, the strobe replaces the builtin flash and all functions are automated. Perfect for most point-and-shoot operation. Note that the lens aperture will always be wide open, at f/2.0 or f/2.5. Same. BW Just like AUTO  the strobe replaces the builtin flash and all functions are automated. Perfect for point-and-shoot operation. Same. P The strobe replaces the builtin flash and all functions are automated. Unlike the AUTO mode, flash +/- exposure compensation and FE lock can be used. Flash exposure will always use the lens wide open. Same. Tv Flash exposure will remain constant according to normal E-TTL rules (that is, the exposure remains constant  not necessarily the amount of flash output). If lower speeds than flash sync are chosen, the flash output will be added onto the overall exposure. 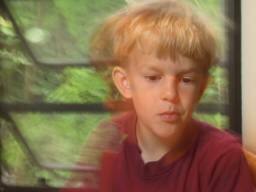 If speeds higher than 1/250 are chosen, the camera will fire at 1/250. Same, but with an interesting twist for the 550EX: by setting the TV speed slow, say 1/4 or 1/2 second, the 550EX stroboscopic "MULTI" function can be used in 550EX manual mode. To my knowledge, this is the only good way to get the 550EX's stroboscopic "MULTI" mode to function with the G1. You can also set the slave strobe output manually, and lock it to a value you think is appropriate for the aperture, which will probably be wide open. Av The flash exposure will be added-into the overall exposure, to create a "slow-sync" situation. The shutter speed will be chosen independantly of the flash exposure, so if you're shooting in a dark restaurant, you may have 1 second exposures, creating lots of streaking. Sometimes you may want that, but most of the time I expect you don't. Same. Manual exposure and stroboscopic overrides are possible, but tricky to manage. G2 Update: This is apparently fixed on the G2! The camera will sense the strobe unit in "Av" mode and lock the shutter to a fixed 1/60 sec. If the strobe is set to E-TTL, then it will fire at full manual power. For the 550EX, the "M" manual outputs can also be chosen, with the full seven-stop range from 1/1 to 1/128. The strobe appears to fire correctly at all combinations of focal length, shutter speed (up to the indicated sync speed of 1/250), and aperture. The "MULTI" mode is not supported. If the strobe is set to E-TTL, the strobe will fire at full-power manual. If the strobe is set to M or "MULTI," it does not fire at all! This last is a major disappointment, because it prevents the ST-E2 from being used as a means to slave-control the 550EX with other external studio-flash units. So it's not possible to use the ST-E2 as a workaround to the wide-angle flash overexposure problem. The lack of good manual controls really relegates the ST-E2 to either direct single flash or mixed flash/ambient use. You can't use it easily for mixing strobes or firing slaves, but flexibility of placement makes it very useful for adding a fill or to provide some variety to existing lighting. IF YOU HAVE A G3: Please help me test the following against this new camera! For reasons that elude me, no G Powershot can use the strobes' built-in focus-assist lights (though I haven't yet checked the G3). This is particularly problematic for Pro90 users, who have neither a focus-assist light on the camera or an optical finder for manual-strobe use. The ST-E2's focus assist, being less obtrusive than the G1's, would be a very welcome alternative (As many D30 users have discovered). For 550EX users, the flash range indicators don't function  Canon probably didn't bother with them since the E-TTL flash always sets itself to a single wide-open aperture (unless you use the "f/8 trick," as mentioned below). Likewise, the 550EX's "modeling light" function is completely unsupported. The ST-E2/550EX/420EX is supposed to also support multiple-strobe usage with varying output ratios  using the ST-E2 (or a 550EX), the strobes can be grouped together and their outputs adjusted as a whole  so you could set the strobe(s) on the right to output two stops below the strobe(s) on the left, and the computer would sort out the differences and exposures there on the spot. Great idea  but so far I've been unwilling to part with another two or three hundred dollars to pick up a second Canon strobe, especially given that I've no information that the ratio function will actually work at all (I've heard, in fact, that it does not work with the Powershots). Some of these problems are quite frustrating. E-TTL works for the most part, but it's surprising how awkward the implementation is, especially with respect to the Av function. The inability of the ST-E2 to fire the strobe in manual mode is incredibly annoying. I started the table above simply so that I could keep track of what worked and what didn't, because the system doesn't warn you and Canon's manuals are silent on these issues. The G1 E-TTL implementation gives you essentially only two choices of f/stop. You can either use E-TTL in the "normal" way, in which case the lens will be wide open a f/2.0 or f/2.5, or you can use the "f/8 trick" (Tv mode at 1/640 or higher) to force the camera to use f/8. So your choices are limited to the widest possible aperture or the smallest possible aperture, and nowhere in between. More than a little annoying! Thankfully this too has been improved in the newer G cameras. Good flash operation should be a high-priority issue for Canon  as has been shown here and elsewhere, the camera's lens and CCD perform better under strobe illumination than under "hot" sources. If you want the best color, you should use flash. The broken G1 flash system was a disappointment, so it's not surprising that the later cameras have greatly strnegthened the flash performance. 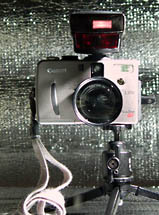 When Canon first started demonstrating the G1 at shows like Photokina 2000, they showed it connected to a professional studio strobe system. Their marketing was clearly aimed not at point-and-shoot users but at "prosumers." They continue this same tactic in their print ads  saying that the G1 introduces "photography" to digital photography in their American publicity, while in Japan they promote the camera in the pages of Commercial Photo magazine, a pro trade publication. Powershot.com's ad copy reads: "Whether you're a professional or just want to take professional-grade photos, the Powershot G1 is the digital camera for you." Similar language is used to promote the G2, and now the G3  which looks to have gotten flash right. "The amateur compact G1 digital camera was designed around the EX series Canon flash units to work totally automatically. Using any other form of flash the camera will have to be set manually but it is not possible to guarantee results. The only way to overcome this is to carry out tests with the studio flash being used." So you can see that the spin doctors are busy. The same problems are present in the Pro90  how can Canon explain it then? Will they actually claim that "Pro" == "amateur"? Sadly, it looks like the flash problems are even worse with the Pro 90. Initial tests with a Pro 90, ST-E2 and a 420EX didn't work  at all! The strobe would not even fire. Canon's sales reps are reluctant to approve, but you can use the ST-E2 and 550EX as a manual wireless strobe setup on almost any camera with a hot shoe  say, an old Canon A-1 or a Contax G2. You can then use simple optical slaves for a multi-strobe wireless setup (since in manual mode, the 550EX won't use a preflash). Surprisingly, the Canon reps at PMA 2002 seemed to be quite unaware it could be used this way... a very useful method to those of us with a mixed bag of cameras.